Views is an important concept in the vision of Dynalist. Basically, a view is another way of displaying the same content. For example, a Dynalist can also be shown as a mind map, as the underlying data is the same — nested lists. Some of the views that we’re interested in experimenting with include Mind Map View, Kanban View, Calendar View, Presentable View, and Column View. Since these views are largely experimental right now, feedback is very welcome. Article View is a simple view that displays the bullet bullets as normal paragraphs. This view hides the bullet points and adds more margin between the paragraphs. You can switch to the Article View by clicking on the menu icon at the top right corner and select “View as article”. This option is only accessible on web and desktop app right now. 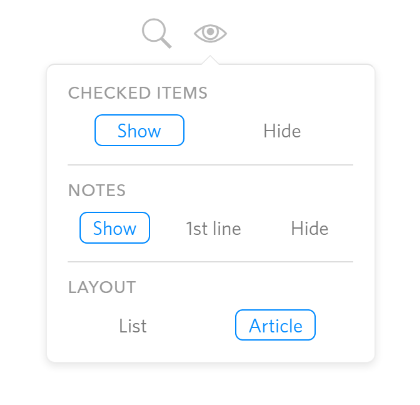 We recommend using this view to preview your writing if you’re using Dynalist to iterate on your writing. This view displays Dynalist documents as mind maps. This view is at very early stage of development and is experimental right now. Only Pro users can access this view as this will be a Pro feature. If you’re particularly interested in trying this out, don’t hesitate to let us know! To access this view, change the document URL (in the form of https://dynalist.io/d/[DOCUMENT_ID]) to https://dynalist.io/mindmap/[DOCUMENT_ID].